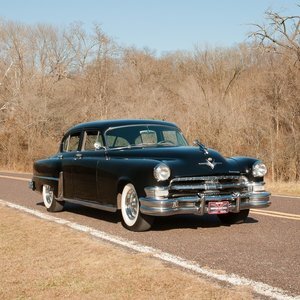 It is difficult to avoid the use of superlatives when talking about this Chrysler Imperial L80 which was originally built to compete against high quality American manufacturers like Lincoln, Cadillac, Pierce Arrow and Packard. The first thing you notice is its sheer presence, this is not a car you can pass by without being aware of it, secondly you will surely be impressed by the elegance of its very rare Le Baron “Traveler” dual cowl phaeton coachwork and thirdly you will be struck by its amazing patina – this car is 90 years old and carries its age with great style, not for it the pretended newness of being fully restored but more the genuine look of years of motoring and growing old gracefully rather than undergoing lots of cosmetic surgery (apart from the bonnet which has been repainted!). 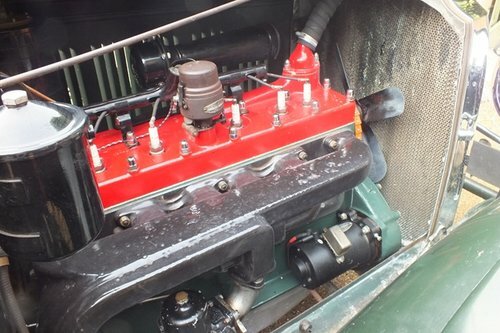 Imperial L80s came with a very high specification including Chrysler’s six cylinder 309 cubic inch (just over 5 litre) high compression seven main bearing Red Head engine rated at 112 bhp which was a lot more than most, if not all, of its competition. 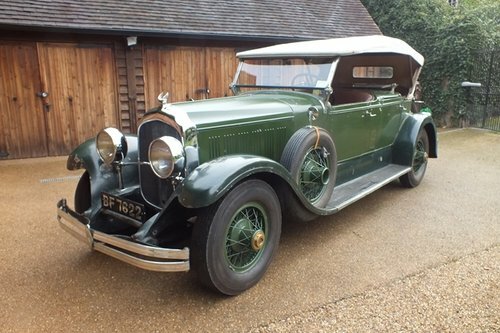 It has a very good three speed gearbox and unlike most other similar cars it has hydraulic rather than mechanical brakes which are very useful given its estimated top speed of 100 mph! 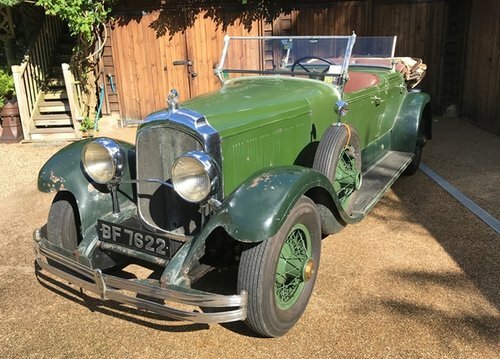 This car, which spent nearly all of its life from 1928 up to 2012 in the ownership of one family and is now in the hands of a very well known motor racing personality, has been the subject of a considerable amount of work in the last in three years. This has been recorded in remarkable detail and includes (but is not limited to) the wire wheels being rebuilt with new rims and spokes, the brakes being relined and the brake cylinder seals being replaced, the springs being dismantled and refurbished as necessary with new spring mounting rubbers being fitted. There are new wheel bearings on the front and rear axles plus the differential, king pins and steering components were checked and found to be in good order. The gearbox was checked and rebuilt with all new bearings and a new clutch plate was fitted, the sump was dropped and the engine found to be in good order and it has been fitted with a new external oil filter – for the record it maintained very good oil pressure and water temperature when I recently drove it 50 miles from its home to my place. The electrics have been converted from 6 to 12 volt and the dynamo (which is still with the car) has been replaced with an alternator. The nett result of all this work is a car which is a real pleasure to drive. I have to admit that at first it was a bit daunting as this is no baby car however once you are out on the road you soon discover that it is much easier to drive than you might expect. The engine is very smooth and remarkably quiet – so much so that at first it is easy to think that it has stalled when you stop at a road junction but a quick blip on the throttle tells you it is still running – and there is no question that it has plenty of power! The steering is surprisingly light even at low speeds and the car tracks well and the large drummed hydraulic brakes are well up to their job. Like any non-synchromesh gearbox you have to get used to the ratios but clean changes soon come with a bit of practice and any way there is so much power on tap you don’t have to change gear that often if you don’t want to. 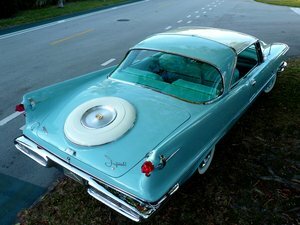 There is also an extensive file of both original and copied Chrysler literature including a service manual and an instruction book. 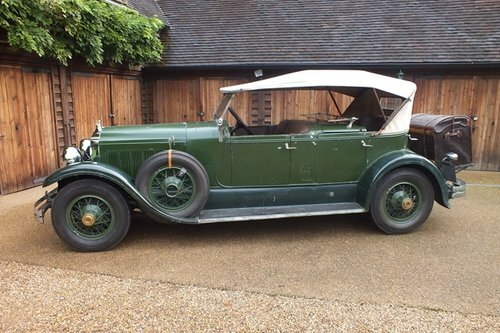 There are also many magazine articles relating to the Imperial 80 which are far too numerous to itemise here but will surely provide you with as much information as you are ever likely to want on these splendid cars. In summary here we have a really good example of one of jazz-age America’s top line motor cars which will definitely set you apart from the crowd as you won’t see many other Imperial L80s of any sort here in the UK and of the up to 31 Le Baron “Traveler” dual cowl phaetons originally built I believe that only two still exist and the other one is still in the USA - it is also remarkable value for money! 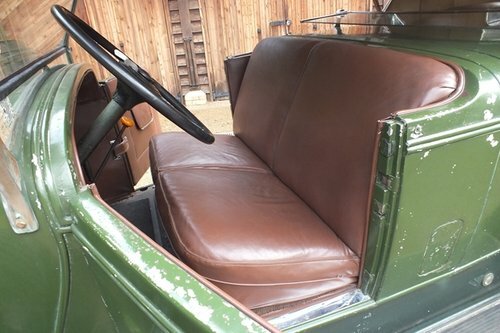 On the button, no rust, tidy car, left hand drive, bench seats. Pillar-less doors, electric windows, good tyres. 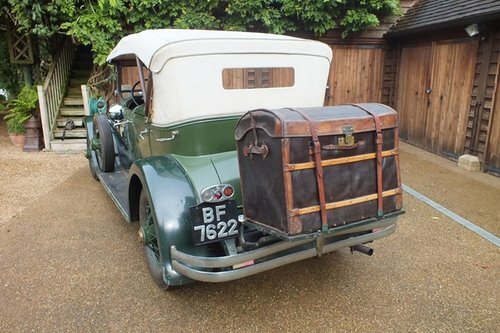 I have to sell as I need the room, lovely to drive, has good brakes, please telephone for further information.